Spend enough time around food and eventually you develop very specific opinions about certain items. A chef buddy of mine can deliver an entire treatise on why kosher sea salt is the one salt to season them all and table salt is of the devil. Another will pin you to the wall with his thoughts on pink champagne – he’s not a fan, to put it mildly. Personally, I have much to say on the subject of bell peppers. It can be summed up thusly: green bell peppers are a tragedy that has been foisted on the produce-buying public and are only good for very specific things, namely gumbo. Beyond that, you can have all my share. Green bell peppers are actually red and yellow bell peppers that have been picked too soon. I find them bitter in the extreme and for years thought I didn’t like bell peppers at all. Turns out, I just don’t like under-ripe ones. Because they spend less time on the vine, they are both cheaper and more plentiful than their red and yellow brethren, which is why they are also so much easier to find. Since they are so common, let’s take a moment to celebrate the lovely red bell pepper. Red bells – along with yellow and orange bells – are lovely. They are sweet and provide a pop of color along with a delicious crunch in any stir fry mix. 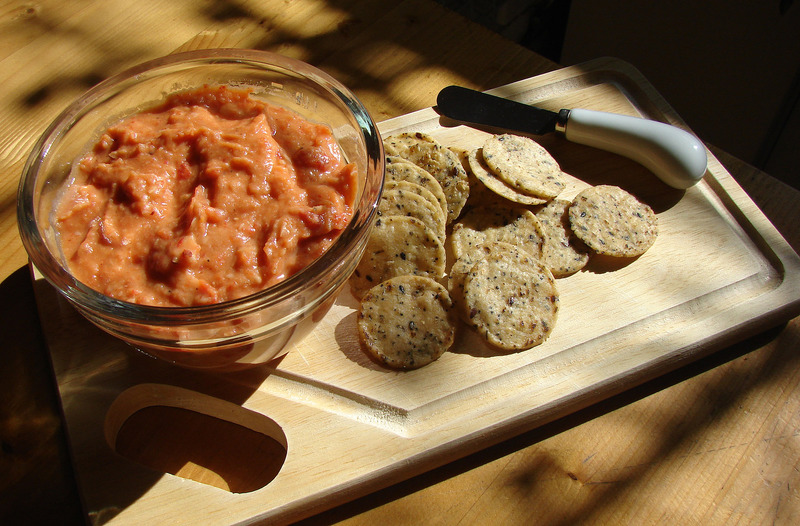 They can also be roasted for the white bean pepper dip recipe below. I like this recipe because it as a creamy texture but no dairy or oil is used. It’s also full of fiber from the white beans and would pair well with any chip or a platter of raw veggies. A good choice for any end-of-summer barbecues coming up. Most variations on this theme ask that you buy a jar of roasted peppers, then work from there. I’m not a great fan of buying a processed item when I have the raw goods right in front of me. So here’s a quick lesson on how to roast a bell pepper. Step 1: Fire up the broiler or your grill. If you are feeling especially daring, get a blow torch from B&C Hardware. Whichever way you go, a source of high direct heat is needed. Step 2: Oil the pepper. This involves brushing or spraying with olive oil. The oil makes the roasting process go a lot quickly and promotes a nice even char. Step 3: Apply pepper to heat. Either pop it on the grill or under the broiler. Or hit it with the torch. This process takes about 5 to 7 minutes. All you need to do is stand by and occasionally turn the pepper. The skin will blister and blacken – which what it’s supposed to do. When the skin has blackened entirely, move the pepper to a bowl and cover with plastic wrap. Let it stand for a few minutes to steam. When the pepper has cooled enough to handle, use a paper towel or dish cloth and rub off the charred skin. You will be left with a very limp – yet flavorful – bell pepper. Chop it up, remove the seeds and proceed with the rest of the recipe. The other item that most recipes ask for is a food processor. I made this in a standard blender and it turned out great. You could also chop the pepper finely, mash the beans by hand and mix everything together that way. The end result will be a little more rustic, but just as tasty. I worked from two different recipes to make this. One called for the juice of a whole lemon and the other, the juice of a half. Personally, I found the juice of a whole lemon to be a bit much, so I suggest starting with a half a lemon and letting your taste buds guide you. The dip will keep for up to a week in the refrigerator and also makes a great spread for sandwiches. In a food processor, chop up the garlic. Add the beans and roasted red peppers until smooth. Add the lemon juice and fresh rosemary. Puree. Remove the dip from the food processor. Put in a bowl. Add the red pepper flakes and salt and pepper. Stir well. If necessary, add more seasonings. Serve with pita chips, bread, or raw vegetables.